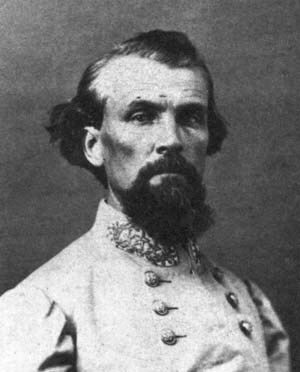 Confederate General Nathan Bedford Forrest rose from the ranks to become a daring and audacious cavalry commander during the American Civil War. Forrest was born in Chapel Hill, Tennessee on July 13, 1821. With the outbreak of the Civil War, he enlisted in the Confederate Army as a private. Soon his wealth and prominence were recognized and he was commissioned a lieutenant colonel with the authority to recruit and equip a cavalry command. Forrest rose to the rank of lieutenant general, and his command gained prominence as he led its escape through the Union cordon surrounding Fort Donelson in early 1862 and it served as the Army of Tennessee’s rear guard during the withdrawal from the battlefield at Shiloh that spring. Forrest’s cavalry conducted raids in Tennessee, Kentucky, Alabama, Mississippi, and Georgia. His harassment of Union forces delayed General Ulysses S. Grant’s prosecution of the siege of Vicksburg. At Chickamauga, the horsemen fought principally as dismounted cavalry and later pursued the defeated Army of the Cumberland toward Chattanooga. As the war progressed, Forrest became embroiled in the controversy surrounding the alleged “massacre” of black Union troops during the capture of Fort Pillow. Forrest was not formally charged in the event. Later in 1864, Forrest won his greatest victory, at Brice’s Crossroads, Mississippi, as his 3,500 men defeated a Union force more than twice their size. As more Union forces were designated to deal with Forrest, the audacious Rebel experienced defeat in cavalry actions at Tupelo and Murfreesboro. After receiving word of General Robert E. Lee’s surrender to Grant in Virginia in the spring of 1865, Forrest surrendered as well. After the war, Forrest failed in a railroad venture and became an early member of the Ku Klux Klan. He managed a prison work area on the Mississippi River. The depth of his involvement in the Ku Klux Klan remains the subject of speculation. However, he is believed to have stepped back from the radical terror organization into which the Klan developed. Late in life, Forrest delivered a famous speech of reconciliation to a gathering of black Americans. He died on October 29, 1877. Tags American, american civil war, Army of the Cumberland, battlefield, cavalry, Chattanooga, Chickamauga, civil war, civil war nathan bedford forrest, Confederate, Confederate Army, Fort Donelson, Fort Pillow, general, general robert e lee, Kentucky, Ku Klux Klan, military, nathan bedford forrest, OSS, Robert E. Lee, Shiloh, the american civil war, the civil war, Thor, Tory, Union, union forces, Vicksburg.